You may have heard that China became the third nation to land a spacecraft on the moon, a momentous achievement overshadowed only by the country's other recent accomplishment: Turning a lung-smothering smog problem into a smogpportunity. 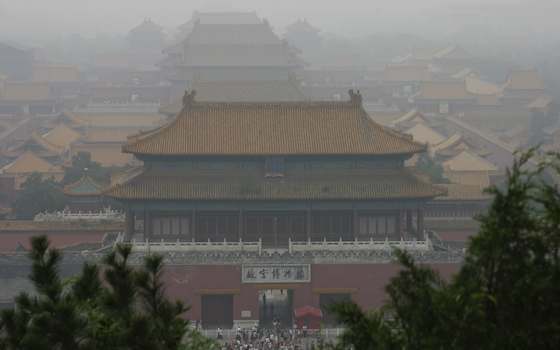 China has lax environmental laws and a massive number of factories that make virtually everything you own, and that has turned the country's air into something along the lines of a runny, carcinogenic pâté. But are the Chinese people going to let deadly pseudo-air get them down? Not if their state-run media has anything to say about it. 1) It's a common enemy, and that unites people. 2) It makes people more equal, because rich and poor must breathe the same air. 3) It makes people more aware of the price the nation pays for its extensive manufacturing. 4) It boosts people's senses of humor, as everyone jokes about the smog. 5) It makes people smarter, because they have to learn about pollution and the history of haze. If only Americans could have such a clear view on something so difficult to see through. Granted, our country has some haze, but we've yet to produce truly patriotic, team-building smog. Still, we can utilize the Chinese government's de-badification technique to goodify some of the problems we're lucky enough to have. 1) Overweight kids often get picked on because they can't run fast. But if all of our kids become overweight, none of them will be able to run fast. Bullying problem solved. 2) The country's elastic youth waistband industry is booming. 3) Americans are happier because chubby kids are nicer to hug than those bony, scrawny ones. 4) Adult Americans are more united, because we all live in fear that an enormous, slow-moving child might sit on us. 5) Bigger is better, thus our children are the best in the world, and that builds national pride. Another problem is the dismal approval rating of the 113th U.S. Congress. According to Gallup, only 9 percent of Americans are happy with the job our political leaders are doing. 1) The Gallup poll shows that 86 percent disapprove of the job Congress is doing while 9 percent approve. That means that a full 95 percent of people polled actually know there's something called "Congress." That's progress on the education front. 2) Virtually anything lawmakers do -- short of, perhaps, murdering puppies -- will be viewed as progress by voters. 3) 9 percent is better than 8 percent! 4) Congress' complete incompetence makes anything regular Americans accomplish seem, by comparison, impressive. This includes managing a bank account, walking without falling down and speaking to another human without lying. 5) This is the least productive Congress ever, having passed only 55 laws this year. Laws are made to be broken, so the fewer laws we have, the fewer laws we'll break. That will keep hard-working Americans out of jail. 1) Owing this much money has taught Americans what comes after "a billion." 2) At least we don't owe it to the Canadians. They don't even have decent smog. 3) Americans will have heartwarming bonding experiences while learning to speak Chinese. 4) America's childhood obesity problem will be wiped out when our children are given "glorious manufacturing jobs" that include calorie-burning 19-hour shifts. 5) Our new Chinese leaders will undoubtedly be more popular than the current Congress. And there's a pretty good chance they'll get more done, as well.